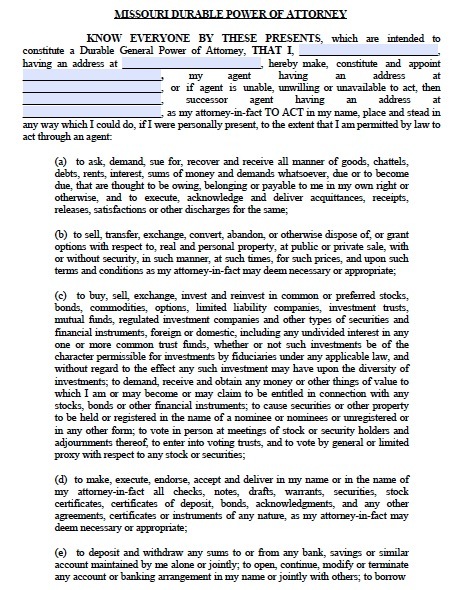 People often create a power of attorney to have an agent conduct various financial transactions for them. In Missouri, you can authorize your agent to sign checks for you, pay your bills, enter into contracts, make investments for you, and perform property transactions like buying, selling, or leasing real estate. There are no formalities required in Missouri to make the power of attorney valid, but it is recommended that you have the document notarized to contribute to its authenticity. You also need not consult a lawyer, but discussing your goals and finances with an attorney can help you draft a more effective document that meets your needs more specifically. For example, if you want the agent to have the right only to pick up checks from one organization and deposit them into your bank account for four weeks, you can draft the power of attorney to grant only that power, and no other power. It can also be helpful to write provisions requiring the agent to keep records of his transactions so you can oversee them.